Former QIT #4 (MLW S-4, 5/51) on display at Havre St. Pierre as no. 1. September 12th, 1998. The QIT currently still rosters an MLW RS-18 (# 46), which sees little service however. It was acquired new in 1968. 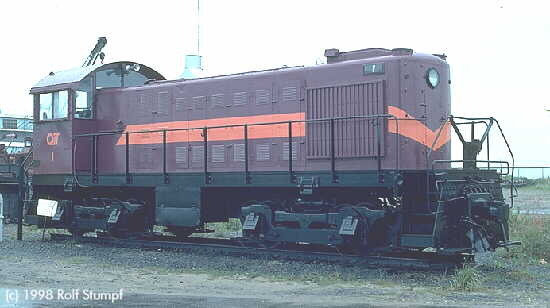 The mining company makes good use of their rebuilt GP9's instead. On my visit in September '98 the 46 was hidden inside a shed, only the rear visible.